What constitutes a 'lousy load' in freight hauling? I thought drivers get paid strictly by the mile and not by the "load quality"? When an over the road driver refers to a load as lousy, it isn't a reference to the "load quality." It could be a lot of different variables that make it undesirable, but none of it is in reference to the quality of the load affecting what you get paid. Let's say I have six hours left on my clock when I empty out from my current load at 0700, but my dispatcher needs me to go pick up a live load one hour away from me, but it's scheduled to load at 0900 the next morning. We might call that a "lousy" load. It makes us sit and wait longer than is efficient. Sure, we will get some layover pay, but who wants to be inefficient and settle for such pay when we could be maximizing our pay? The whole point of the context of his remarks is that highly valuable drivers who are willing to do what's needed will be rewarded for taking such loads willingly and agreeably. Old School, with that in mind, I think most drivers would favor drop and hook over live loads. Some companies probably do drop and hook exclusively or most of the time. Drop and hook sounds like my kind of bag. This practice seems common in freight railroading. Yes, I personally hate being inside a motor vehicle that is NOT MOVING! It's aggravating and boring as hell just sitting in my car and be waiting! As a driver I would want to be rolling as much as possible on duty. It's not so much a lousy load as it is a lousy schedule. If you'll haul a LOUSY LOAD for them every so often then they will reward you with consistently good miles, a lot of good runs, and respect and tolerance for you as a driver and nd a as a human being." Taken within the context of Brett’s point; operative phrase is; “every so often”. Focus on that thought Todd, for a good driver it’s the exception and will be rewarded whenever possible with a much better load. I am not the best person to reply to this since there are very few Walmart store loads that I consider “lousy”. Having the dock out time delayed by several hours is about the worst thing I deal with. Rainy’s reply suggesting it’s subjective is a good answer. Everything must be applied to the bigger picture, good drivers, conducting themselves safely and professionally typically deal with their definition of a lousy load as an exception, not the rule. The routes we must drive are predicated by many factors, most out of our control. However it’s a big part of our job to effectively adjust and manage the situation at hand, and exercise good judgement in the case of (for instance) driving during a bad storm. In a Utopian world all shippers/receivers would be within 1 mile off the Interstate exit. Rarely the case and complete fantasy if that’s your expectation. You must safely and efficiently conduct business as if you are your own boss; making good decisions based on sound, well grounded judgement. As a car driver on long trips occasionally, I see the heaviest concentration of big rigs on Interstates and major/state highways. It's just an observation of mine. I see few trucks on rural roads unless they are logging trucks, grain/feed trucks, hay trucks, fuel tankers or milk tankers. I can't ever remember seeing a dry-van or reefer a rural/county road. "But companies are desperate for good drivers so if you can prove to them over a period of time that your are safe, hard working, and reliable then they will do their best to compromise with you. If you'll haul a LOUSY LOAD for them every so often then they will reward you with consistently good miles, a lot of good runs, and respect and tolerance for you as a driver and nd a as a human being." Now, I can see some ROUTES' being lousier than others. I would always want to be driving on the relative safety of well-maintained Interstates (the beaten path) as much as possible and far away from high-crime areas and traffic congestion as much as possible. Flat, straight, wide open roads in moderate climate would be more welcome than ice-cold twisty winter mountains with treacherous grade percentages and scorching summer deserts. My two cents may only be worth that, but here are mine. A gun is a big no, even if you have a concealed carry doesn't mean it's valid in the state your in, stun gun, well some states are making it illegal to own or use, pepper spray, colder weather can be an enemy to there effective use. Personally, a cheap and effective weapon for defence, a wire coat hanger, hit someone with one of those folded and they will be wishing that they had thought twice about messing with you, plus it will mark them, it's easy to carry, (even concealed) and it's a light quick weapon, that would not be easily taken away. Also, big plus, legal in all states, it's a freaking coat hanger. Being a life member of Gun Owners of America you know how I feel about anti-gun attitudes. I would rather be armed with something more formidable than a coat hanger if some 400-pound linebacker of a thug were attacking me. Even pepper spray. What about a police taser or a stun gun? Cynthia, most of the job types you'll run across in trucking are "drop and hook" (simply swapping trailers) or "no touch freight" (just like it says). Physically the hardest thing you'll deal with are landing gear cranks, and tough door latches. Both are covered here. A help for for latch problems: sometimes the way the ground is causes the trailer to not be square. If the door won't get closed, pull forward a few feet, and that may straighten the trailer up. Are trailers that flimsily constructed that uneven ground will cause doors to jam? Sounds like the 1992 Corvette coupe with targa top I had. The book said the car had to be parked on level ground or the four screws for the removable hard top would not line up to anchor it down to the body pillars and windshield header. The fiberglass body had that much give in it. I hated driving the car with the top off because it shook like the devil.The soft-top convertible (roadster) 'Vettes have a much more rigid frame and are heavier. Do sleepers have microwave ovens in them? You're not lazy but you are hoping to fight a family over a will of their dead mother in order to not have to work and fill your bank account???? An elderly woman I knew for 33 years just passed away a week ago. She had money and property in opulent Marin County, California and I was told by one of her sons 18 years ago that I would be in her will in place of her older son whom she supposedly disinherited. She even told me I would be in her will herself 10 years ago. Next month, I will be checking the probate court records to see if this was really true. One of her sons might be the executor of her estate and I don't want to question him about this personally. Just in case this will business was all a lie, I will have to find another way to fill my bank account with cash for old age. So you only intend to work if you have to. But not lazy? Not living off of others? You do realize a will can be changed at any time. If you are in a will a lawyer will contact you. No one is obligated to keep you in a will even if you were told a year ago, it could be changed. WHY would you put all.of your hopes on the will or someone else? Your own statements prove your lack.or.commitment and it is insulting. I was only stating that I was promised to be in this woman's will by her and one of her sons. I am not staking my soul and betting my VA Pension that this promise still holds true. I will not commit suicide should I find that I get nothing from this woman's estate after all. I will check with the probate court in a month or two to know the truth once and forever unless I get something legal to this effect sooner in the mail. No person alive is going to reject any inheritance they are offered. Todd, one note about your diet. The low-fat thing was kinda debunked a long time ago. Low carbs, high protein, and fairly high levels of fats are the better way to go. For decades they preached low fat and low cholesterol meals. Turns out they were totally wrong about that. I train hard 6 or 7 days a week. I eat more of a Keto or Paleo type diet, close to a carnivore diet - mostly meat, eggs, and full-fat dairy including yogurt and pineapple cottage cheese. I'll have a bowl of oatmeal with my eggs and I put blueberries in my oatmeal and cottage cheese. I eat almost no vegetables whatsoever. I eat almost nothing that's white - no bread, no pasta, no potato. So basically I eat piles of meat, eggs, and dairy. Most people are having a heart attack after reading that. It's an appalling diet according to old standards, but opinions are changing rapidly. I'm incredibly healthy in every way. I couldn't train as hard as I do and be healthy if I wasn't eating right. I never, ever get sick. Not even the sniffles in as long as I can remember, possibly years. If you're feeling lousy it's worth taking a shot at a different diet. Obviously what you're eating isn't working. It takes about 30 days for the body to adjust to a change in diet so you can't just try something for a few days. And it's best to adjust slowly, not all at once. Getting away from carbs has been life changing for so many people, but the body adjusts slowly to that change. Carbs are like an addiction. If you cut carbs too quickly you'll feel super lethargic, almost like you have the flu. So if you make any changes to your diet, make them slowly and give them a full month before you decide if it's working or not. Everyone is different. You have to experiment to see what works for you. lunch: one or two chicken salad sandwiches on white bread, with lettuce and tomato sometimes, one tablespoon mayonnaise (100 calories), a dash of mustard and a couple tablespoons of non-fat plain yogurt as a low-cal filler so not too much mayo is used: the mayo for sandwiches is where I fudge on the diet OR a sardine sandwich with two cans sardines packed in water with a tablespoon of mayo and some steak sauce poured on. My steak sauce is 25 calories per tablespoon the bottle says. dinner: a plate full of frozen vegetables as spinach, green beans, carrots and peas, a starch such as long-grain white rice, cornmeal polenta or pasta, I use a tablespoon of corn oil for the rice and a tablespoon of corn oil for the pasta so it doesn't stick while boiling, my spaghetti sauce is made with one tablespoon of corn oil, and a meat item as a skinless chicken breast or a 7%-fat grilled hamburger patty. Grill means LP barbecue grille. I don't ever buy butter anymore and seldom buy cheese except occasional lower-fat swiss cheese. The days of French toast, frozen waffles, butter and syrup are long gone for me. I also take a prescribed baby aspirin everyday to "prevent heart attack"
But, but, earlier you stated something to the effect that your doctor says your heart is in perfect condition?!? Yes, my ticker is perfect condition so my doctor told me the other day. The aspirin is just a precaution that doctors do for older patients perhaps because of my age until my obesity is averted. I have never had a heart attack and don't ever want to start having one. People in my family have died of heart as well as cancer issues, I told my doctor. It is common to put older people like me on an aspirin regimen these days. Obesity is still a major risk factor for a heart attack even if my doctor thinks my heart sounds strong when he puts a stethoscope on my chest. My father was a retired Army Colonel, prior enlisted who did 3 tours in Vietnam. He earned his pension / retirement. 7 years and an injury doesn't provide with an actual pension and it is most definitely paid for by taxpayer dollars. Myself, I served in the Air Force. Desert storm vet and saw time in Bosnia as well. I declined my disability because I knew what it would mean for my future. My suggestion to you is to get over your damn pity party, put your testicles back on and get to work. That is, if you're really serious about this profession and not just being a troll. I am just back from doing my house chores. Right now, I am preparing for work again, Mr. Robert B.
I am going to take that VA wellness (MOVE, weight, diet, exercise) program as serious as a heart attack from here on. Like my very soul depends upon it. I've already told my doctor at the VA just last week that I wanted to get back to work possibly as a truck driver. He told me of a VA "jobs program" that I might be eligible for. I will have to call him up and ask him again tomorrow more about that program when I call up to schedule to see a VA dietician and MOVE counselor. Now I understand: until I come back here someday and announce that I have been accepted into the CDL program by a prospective employer or a private school, nobody is going to believe a word I say here or give me an ounce of empathy. I wouldn't lie about that. I would only announce that if that were to be true. I beat the beer, booze, and Marlboro Man years ago. Unfortunately, quitting smoking and drinking led to over 125 pounds of blubber. The Little Debbie brownies. The pizza. The bacon cheeseburgers. The potato salad. The macaroni salad. The fries. The Popeyes fried chicken and gravy. The shakes. The candy. The chips. The bacon. The sausage. The Johnsonville Brats. The See's chocolates by the box full. The ice cream by the gallon. Going to college and earning an associates degree in computers while stuffing my face full of these things every day to calm my nerves while slaving my brain over textbooks since I couldn't light a Marlboro anymore. Asthma attacks, chest pains and several ER visits from such made me give up the tobbackkie for good. The thought of lighting up a cigarette right now puts the morbid fear of God in me. Those things are so expensive now and I can't afford them anyway. That's good. Cigarettes can go up to 1 million dollars a pack for all I care. Playing PC games constantly while still medicating on junk food when I gave myself a break from study instead of bike riding, swimming, going to pump iron or walking for exercise daily. I hate all this geek technology. It destroyed my health. It gave people an excuse to be fat and lazy. Before computers, I to do a lot more physically active things to pass time. Now, I have to beat the blubber and the fatigue my doctor thinks my obesity is most likely the culprit . Now, folks I got to get cracking on Raw Truth again. Where there is a will, there is a way. I now have to stand the test of my will and time. I'm 54 years old right now. I will not live forever. I don't want to wait too long before starting to make some decent money. I'll be dead and it will be too late. I'm in hurry to get right out of poverty. So, I might have to take some crappy local job as a janitor for a year or two to go from disability to trucking? Yes. You might have to become a productive member of society and prove your commitment and ability to hold down a job without the disability returning. If you cannot work a week at a local job.with less demands than truckng, then you have no business driving a killing machine. Oh big deal. You directly asked a major trucking company if they will automatically disqaulify a disabled person. The answer will be no. Otherwise they are in violation of the Disabilities Act. What they will do is bring you to orientation, go over your history and send you home. Then it is not discrimination because they gave you a chance. Its the same legal loop they use when involving psychotropic drugs, which I am now sure you are on. In case you didnt know, companies can demand MORE than the basic DOT physical. You can go to a doctor and pass, but go to a.company and fail. This is one of the reasons I suggest company sponsored training. If you go to a company taking Trazadone as a sleep aid, you can be sent home and told to switch to another med for 30 days or until stabilized, and come back to orientation. My sister died 4 years before I went to Prime and i admitted to taking the antidepressant Effexor then. I was told "If it was more than 3 years ago it is not an issue", and i had my med record to prove it. That gave me the impression that it WOULD have been a problem had it been less than 3 years. And each company can set its own standards. Swift might accept your med record at orientation and Prime send you home. You have no idea what the physical exhaustion can be in trucking. Add that to the fatigue from which you suffer...and you admit your doctors assume if you lose weight that you will improve. What if you dont? What if you get into training and your fatigue returns and you roll the truck and kill people? If you lived, would you even care, because right now you seem to care for no one but yourself. You need to concentrate on getting well. In every way, physically and mentally. Rainy D., clarifications on meds. I also take a prescribed baby aspirin everyday to "prevent heart attack" and prescribed Imodium as needed for occasional diarrhea. I take no psychiatric drugs and I am not prescribed such. I'd like to hear from people on this board who are in the same boat as I am. Middle-aged and have been out of work a while on disability and have that strong urge to make the kind of money an OTR driver makes. Robert D. (RAPTOR) is a great example of it. He truly is an inspiration. He was involved in a nasty motorcycle wreck 7 years ago. He's worked hard to get where he is. According to his profile he had 5 surgeries and physical therapy.He previously drove, and now he's rejoining the industry and he understands that his prior experiences don't mean much. He's willing to do what you refuse to do, approach it with an open mind. I spent close to a year flat on my back. I couldn't WAIT to get back to work. How many years have you ridden that gravy train, sucking down taxpayer's dollars? I have legitimate injuries from my service that my brother berates me every time he sees me, because I refuse to go to the VA and take doctors time away from those who truly need it. ...is no gravy train. It's a life-support system at best in today's economy. I see I will get no empathy from people here so I will mention my military experience, VA status and "alleged disability" (in your minds) no more. I don't even know why I continue to fight back when I take a beating from people here. I think I will just totally ignore all negative words here from now on and get busy with my "beat-obesity" regimen and reading Brett's material in between. I finally agree with you all now. Typing words here all day long will make me neither a penny richer or healthier. With that comment you're an insult to anyone that holds down a job to support themselves. You seem to have plenty of time while living off the taxpayer's dime to ponder useless drivel and pretend to want to be a truck driver. You could spend that time being a productive member of society. Meanwhile, the janitor is out there getting it done. I have far more respect for the janitor in the "crappy" job than I do for you. I'm living off a VA benefit, officially called a Pension, I earned as a soldier of seven honorable years of service to my country. Right now, it's exactly $1,127/mo. tax free. It is not "welfare". Not by a d_mn sight. It was part of the deal when I signed my enlistment contract. Your harsh comment toward me slaps the face of every American veteran. You might be one of those people who would spit on soldiers at airports during the Vietnam era. 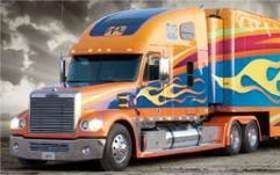 I want to become PHYSICALLY well enough be able to make a trucker's income. The more I make the more I would pay Uncle Sam in income taxes. High income taxes are a sign of making good money. You see. No, you aren't. You don't get a pension after 7 years in the military. But if you go to the VA and claim some BS like "chronic laziness, I mean fatigue", you get a disability pension. Meanwhile, veterans who lost limbs and have TBIs can't get in to see a doctor, because people (not my original choice of phrase) like you are sucking up their time with BS. Anyway, I'm just back from my three-mile physical rehab bicycle ride. I feel better right now especially after having my chicken salad sandwich made with about a tablespoon of mayonnaise (100 calories) and the rest of the dressing non-fat plain yogurt as a filler. Unfortunately, many people in America don't believe in "chronic fatigue". Many doctors don't even know how to diagnose it. There's too many attitudes these days that people claiming "chronic fatigue" or "fibromyalgia" are "lazy bums". For me to be able to work as a truck driver, a full-time toilet scrubber, a carpenter or a full-time Walmart door greeter standing all day long I would have to consistently be able to get a solid eight-hour sleep every night and be able to get through the remaining sixteen hours without ever feeling the need to lie down in my bed without feeling weak, dizzy or faint. I am confident my key to success is through a strict diet and a daily exercise regime to get down to a healthy body weight and a healthy body-fat percentage. Yes, I see there are many truck drivers who are morbidly obese but still manage to be productive workers and succeed. I don't know quite how they do it. They could be drinking a ton of coffee (non-decaff kind) to ward off fatigue. My doctor not long ago suggested I try caffeine to see if that peps me up. It does. However, it gives my stabbing pains in the head, makes me feel weird in the head, makes me very nervous, makes me short-winded and causes chest pains and heart palpitations. This was just from drinking no more than 12 ounces of Diet Dr. Pepper with caffeine. I can't handle stimulant drugs. But I am still welcome to read Brett's material meanwhile as I endeavor to become well again? The meds I take now are only just before BEDTIME. Naproxen for arthritis pain and Flexeril, a muscle relaxer. They do have a sleeping pill effect. I never take them during the day when I have to drive a vehicle. Never. The label says they may cause drowsiness. My doctor also says that the arthritis condition should improve when a healthy body weights is reached and a good daily exercise regime is attained. You see, my hope of ever becoming employable is not yet dead. I don't want people here to be negative and naysayers. I don't want people to say I'm too old or it's too late for me to ever amount to anything. That I should just throw in the towel and jump off a bridge. Age 55 is scary when you've been out of work and on disability for several years and on limited income. I don't want to grow old and die without having attained a house of my own. I feel time is not on my side. Right now I am essentially getting paid minimum wages not to work. I would like moral support. So, the only questions I will post here from now on will be for something to clarify what I read in High Road Training once I get to it. I will get through Raw Truth cover to cover first. That's my resolution for 2019. My goal right now is to get well enough to work ASAP, period. Ok, I have to go on my bicycle ride right now. You’re your own worst enemy. You think certain jobs are beneath you. That kind of thinking frustrates employers. I’ve been an employer, an employee and yes, served in the military for many years. If you think any job is beneath you, when you haven’t worked outside of home in more than a decade, you are the definition of clueless. You say you’re tired of being poor. Well not tired enough. The most successful people are willing to do WHATEVER it takes. You think you’re poor? Watch the real life story portrayed in The Pursuit of Happyness with Will Smith. You apparently have plenty of time for it. When you are willing to scratch and claw your way out of the depths of despair. Willing to leave your comfort zone and step into the unknown, heed the advice of experts and do everything it takes, you’ll begin to appreciate those who ARE willing to do “crappy” jobs. Those people will never be dependent on the handouts of others. When I say a CRAPPY job I mean a typical MINIMUM wage job. The fast-food jobs are generally for those young punks in high school with no prior work experience. I am age 54 right now and will turn 55 come this April. I have seven years honorable military service. Yes, I do feel a cut above minimum wage. Most companies will simply want proof of your employment gap, such as a notorized letter, from someone other than you, to state what was going on during that employment gap. In my case, my employment gap was simply disability. That can be easily verified in writing. The VA had been paying me a monthly pension disability benefit steadily through my employment gap, save for the first five months from the day my disability claim was submitted originally, and documentation for this is easy to provide. I might have a voc/rehab or VA jobs counselor to work with and perhaps that person could even provide a notarized letter as well. I'm sure my VA doctor can sign such letter as well as any letter that might release me to return to work. The state voc/rehab department might even pay for my private CDL school if they support my going into that occupation. My lack of work history can be explained simply by my disabling conditions now. Disabled NOW doesn't mean disabled for life. Just because you can explain it does not mean a company must accept you. One poster stated in the past "I was on disability, they wont hire me and are discriminating against me". He couldnt get hired. And it wasnt discrimination. Plus now you brought up medications that makes you drowsy..which wont be accepted by companies. you have a better chance of working a job at home first than trying to go straight from disability to trucking. thats a guess and im not a doctor but does it make sense to have a guy with chronic fatigue to be a in control of an 80,000 pound vehicle? My point is you may have to be med and symptom free and with verifiable employment for a couple years before anyone will hire you. He could have been passed over for another reason than having been on disability. I have sent a regional trucking company headquartered in Montana, Jim Palmer, a question about its hiring policy regarding verifiable employment and having been on disability for the past several years with verifiable disability income and documentation. PS - My philosophy is that "having being disabled or ill" is not a crime or a lack of merit in itself for those who are willing to work hard and again become productive members of our society provided they can prove they are willing, ready and able to perform their duties in a safe, efficient, timely and lawful manner. Americans seeking to be productive again should not be punished (deprived of opportunity) solely on the basis of any prior illnesses or physical disabilities (not self-inflicted). I've asked these questions because I've heard some rumors (on some trucking website) that some "big name" national trucking companies, I think mostly corporations, allegedly will simply refuse to hire solely on the basis of lack of verifiable work history even in cases of having recovered from documented and verifiable disability while still having the medical clean bill of health to pass the DOT physical and drug-screening "with flying colors". I hope Jim Palmer is more enlightened than that." I would like to get a reply from them in writing.